With all of the recent rain and warm weather, the trial flower patch has bounced back, well, as best it could, half of it having been overrun by pigweed, and the rest starved by three months of near drought. It’s the most striking part of the entire market garden right now, elsewhere it’s mostly duller shades of green under the lately mainly cloudy skies… The lavatera (pink) came along recently, to join the fine showing of zinnias, calendula and cosmos (a couple are poking into the pic at the top left). I’ve also found a few asters, centaurea, and the gypsophilia that came out in August is still around. And there are a few strange scabiosa (Ping Pong variety) as well. (This pic is about 10′ x 10′ at the end of a 50′ x 15′ bed.) I’m quite liking this, although I dunno how much I learned: to successfully grow cutting flowers, remember to weed and water…?! Jill the (tiny) flower farmer here–Your flowers look great! I’ve found that the rest of the trick to successfully growing cutting flowers is in the cutting and post-harvest treatment. You’ll build a good customer base if you can grow bouquets that will keep looking well for an entire week, and that sometimes takes a little trial and error. 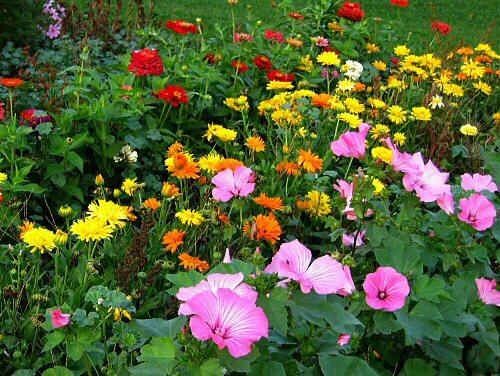 Mostly, that means cutting just-opening-flowers (not old ones–those need to be deadheaded for the plant to keep blooming, obviously) on a long stem, so cut them back “hard” at first. They’ll send out more long stems. Also, cut flowers in the cool of the day, strip all the lower leaves to keep them out of the water, put the stems into a good clean bucket with some sort of preservative solution and keep them cool. That is all there is to it, really. If you’re thinking of growing for your CSA or market next year and want to make nice, basic bouquets, I have lots of luck combining the sorts of flowers you are growing with a nice bunch of basil and some dill for scent and to bulk up the bouquets. My apologies if you already knew all this. Sometimes I get a bit overenthusiastic about sharing! Jill: No, no, that’s great to hear! I’ve read all the basics, as you’ve so clearly and succinctly explained, but it’s most fun and effective hearing stuff directly, in conversation – that’s really cool. The more I tiny farm, the more I appreciate being able to combine information and application. Hearing stuff directly like this carries that extra bit of energy… On the job training, I guess you could call it, rules… Thanks!